A Spell of Trouble is book 1 in the Silver Hollow series. I've really been enjoying mystery novels lately and when I saw this one had paranormal mixed in I knew I had to grab it. I'm pretty sure I got this during one of Audible's 2 audiobooks for 1 credit sales. I find that's a good way to try out some new to me audiobooks whenever I see it pop up. Isolde Quinn (aka Issy) is working at her pet shop when Louella Drummond, one of the town residents comes by with a health inspector to try to cause some trouble. Much to Issy's surprise Louella winds up collapsing and dying. Issy is sure it's a silencing spell that's killed her and when the paranormal division of the FBI come to town sniffing around Issy and her cousins, they all know they have to solve the crime before one of them is framed and taken away. The hunky FBI agent is always one step behind Issy when she's trying to unravel the mystery and it just makes her look all the more guilty. Add in that someone is trying to frame some of the cousins and you have one attention getting whodunit. 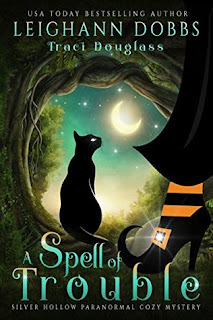 A Spell of Trouble was an entertaining paranormal mystery. I know I need to grab some more in the genre since I love paranormal books. While I was entertained by the story I did figure out who the killer was fairly early in the novel. That disappointed me a bit but I was entertained with all the trouble Issy got into. All in all, this was a good read I'd suggest if you're looking for a mystery novel with paranormal elements.